Note: I originally wrote this review in 2013 for submission to the London Review of Books. The LRB passed, and it has sat orphaned on my hard drive. I figured I should probably put it here. Shinzo Abe returned to Japan’s premiership in December 2012, after spending five years in the political wilderness following his resignation as prime minister in September 2007. Promising bold economic reforms as well as constitution revision and a stronger military, Abe’s message to the Japanese people and Japan’s allies and adversaries around the world can be encapsulated in the three words that were the title of his address in Washington, D.C. this past February: Japan is back. But despite Abe’s self-assurance, these remain anxious days for his country. Unseated as the world’s second-largest economy by China in 2010, Japan continues to struggle to find its footing economically. Its manufacturers are locked into competition with rivals in neighboring South Korea. Its government continues to rack up large annual deficits, contributing to net government debt’s approaching 150% of GDP. Japan’s politicians have discussed new growth strategies for years, with little or no success. At the same time, China and South Korea have pressed claims to disputed islands, and the United States, Japan’s longtime ally, is distracted by problems elsewhere in the world. And all the while, each year Japan’s slow-motion demographic crisis worsens a little more, with senior retirees taking up an ever-greater share of the population — and placing ever-greater demands on the country’s finances. Time will tell whether the Abe government will guide Japan out of the economic stagnation of its “lost” decades. But a newly translated novel by Ryu Murakami, the novelist and filmmaker who is Japan’s answer to J.G. Ballard and Michel Houellebecq, suggests that Japan’s problems are deeper than broken institutions or ineffective policies. Echoing critiques of industrial society dating back at least as far as Friedrich Nietzsche, Murakami believes that Japan suffers from a spiritual crisis. Having grown prosperous, he fears that decadence and love of comfort have prevented the Japanese people from meeting the political and economic challenges their country faces in the twenty-first century. Accordingly, Murakami suggests that it will take more than new policies for Japan to lead in East Asia and the world: Japan needs a revolution of the spirit. Like Houellebecq, Murakami writes “slipstream” novels that border on science fiction, presenting exaggerated or fractured versions of reality for the sake of social criticism. Both authors confront what they see as the nihilism at the heart of post-industrial capitalist societies. Their critiques grapple with Nietzsche’s vision of the society of the “last man” from Thus Spoke Zarathustra. Nietzsche warns that, when society has become too prosperous and too accustomed to comfortable living, humanity will no longer strive or compete. Human beings will conform to mass society, none will desire to rule others, and all will fear hardship and suffering. The pursuit and preservation of comfort will replace all other values. The portrait Murakami has painted of Japan throughout his career is of a country populated by “last men,” who, filled with ennui, seek their silly little pleasures and are incapable of acting in pursuit of higher principles. Seeing his society as dulled by prosperity and “anything goes” post-modernism, Murakami seethes with anger at the frivolity and decadence of modern Japan. But Murakami is not resigned to decadence and decline. His novels seek to shock his readers awake, to force them to see Japan’s spiritual malaise. He struggles to stir his fellow Japanese to confront their society’s sickness head on and to embrace a new national spirit less inclined to conformism and dependence on others. Although From The Fatherland, With Love was originally published in 2005, its English translation from Pushkin Press is exceedingly timely: it provides a striking corrective to some of the heady coverage in the world press of Abe’s return to Japan’s premiership. Even if one disagrees with either Murakami’s diagnosis or his cure for what ails Japan, his latest novel to be translated into English is required reading for thinking about deeper causes of Japan’s enduring stagnation. Set largely in April 2011 — a near-future Japan when it was written in 2005 — Murakami shows Japan impoverished, isolated, and incapable of acting independently even when faced with an unprovoked invasion by North Korean forces. Seeing Japan brought low by a global depression that strains its ties with the US, which has shifted its attention from its alliance with Japan to improving relations with North Korea and the other countries of East Asia, the North Korean regime hatches a plan that seems to serve no other purpose than humiliating Japan. A North Korean commando team infiltrates Japan and takes hostages at a baseball game in Fukuoka, a city of 1.5 million people on the island of Kyushu. Claiming to be a rebel faction opposed to North Korea’s peace overtures with the US and publicly denounced by Pyongyang, they proceed occupy Fukuoka. The US considers it a problem for the Japanese government to solve, since the invaders are purportedly rebels without state sponsorship. The Japanese government itself is initially paralyzed. Afraid that a counterattack will result in unacceptably high civilian casualties in Fukuoka or in North Korean terrorist attacks on government buildings and critical infrastructure throughout Japan, the government eventually decides to impose a blockade, effectively cutting off not just Fukuoka but all of Kyushu from the rest of Japan. The citizens of Fukuoka are left to cope with the occupation force, which calls itself the Koryo Expeditionary Force (KEF) after the Korean dynasty that cooperated with the Mongols to invade Japan in 1274 and 1281. (The invasions, which were turned back thanks to great storms — the legendary kamikaze, or “divine wind”— were centered on Hakata Bay, site of present-day Fukuoka.) The invaders secure the collaboration of local government and police through discriminate demonstrations of force. The occupiers are careful to avoid civilian casualties, treat local citizens politely, and win public support by imprisoning local elites guilty of “anti-social” crimes, such as tax evasion and human trafficking, and confiscating their assets to fund the occupation. At the same time, the national government alienates Fukuokans first through the blockade and then when an ill-considered government-authorized attempt by a police assault team to take several North Koreans hostage results in the death of dozens of civilians. Although individual Fukuokans are uneasy with the occupation, no organized resistance emerges, and over time foreign governments pressure the Japanese government to lift the blockade so to allow trade to resume. Meanwhile, a fleet carrying 120,000 North Korean soldiers to reinforce the occupation departs for Fukuoka. The Japanese government deploys the Self-Defense Forces to intercept the fleet but is unable to commit to a course of action. In Fukuoka, Japanese collaborators prepare a campground for the arriving army and work to procure supplies. Everyone is aware that, if the reinforcements arrive, the occupation of Fukuoka is unlikely to be reversed. We live to destroy. There are only two types of people in this world: those who scrimp and save little by little to build a breakwater or levee or windbreak or irrigation canal, and those who destroy the vested interests and the old system and the fortress of evil with enough emotion and inspiration and fervor and fury and desire and passion fruits to crack open everyone’s skull and ring their balls like bells. Where the establishment fails, these loners succeed, serving as the “divine wind” that defeats the third invasion of Hakata Bay. At the most basic level, the novel succeeds as entertainment. Despite its length, it reads breezily, a testament to the translation work of Ralph McCarthy, Charles de Wolf, and Ginny Tapley Takemori. The scenario described by Murakami is far fetched for a number of reasons, but as long as one accepts Murakami’s premises the novel reads like a better-written cousin of Tom Clancy’s techno-thrillers (or perhaps a write-up of a government war game). But the novel is worth reading because of Murakami’s diagnosis of what ails Japanese society. Murakami suggests that living in a peaceful, wealthy society — with the lowest levels of violent crime among large, developed democracies and a military that not only cannot be called a military but is banned from using arms even in self-defense when deployed abroad — has psychologically disarmed the Japanese people. Over and over again, Murakami depicts Japanese civilians freezing when confronted with violence committed by North Koreans. Most paralyzed, of course, is the Japanese government, which, from the beginning of the novel, is depicted as helpless in the face of economic collapse and international isolation. Resignation was gradually spreading around the table, like a bad smell. Resignation meant submitting to greater power, and abandoning any idea of resistance. Power was built and maintained with violence. A population accustomed to peace had no taste for either meting out or being subjected to brutality, and couldn’t even imagine what it would involve. People unable to imagine violence were incapable of using it. Murakami subsequently describes Japanese politics as characterized by the suppression of any and all conflict, not unlike what Nietzsche’s Zarathustra says: “People still fall out, but are soon reconciled — otherwise it spoileth their stomachs.” In other words, not only are Japan’s leaders incapable of imagining violence, they cannot even bear verbal disagreements for long. There is some disagreement as the government weighs its options, but opponents of the majority quickly fall into line. Just in front of them someone moaned in pain and toppled forward, hands on the floor to support his body. The long shadow of a soldier moving toward him made the man shake his head and whimper like a child. The soldier grabbed his hair and pulled him upright. Still held by his hair, he began desperately apologizing, yelling almost incoherently that he was sorry, as the soldier’s nightstick came down at the joint of his shoulder. After hundreds of pages of these scenes, a reader cannot help but feel numbed. But though Murakami is a self-professed admirer of Quentin Tarantino, there is more to the violence in From The Fatherland, With Love than spectacle. Murakami is driving home the point that, although they live in a society that has driven violence to the margins, the Japanese people still belong to a violent species and live in a violent world. Japanese are not exempt from the brutality with which human beings are capable of treating each other. They cannot hide from it forever. Murakami’s North Korean characters are perhaps the most compellingly drawn characters in the novel. Whereas at times his Japanese characters — the shrewd reporter, the dithering politician, the selfless doctor — seem like caricatures, the North Koreans are fully fleshed out. One gets a clear sense of the mixed emotions they feel when they encounter Japanese prosperity for the first time and the ways in which they have been marked by their lives in spartan North Korea. In the afterword, Murakami discusses the extensive research he conducted on the North Korean regime and everyday life in North Korea, including interviews with refugees from the north living in Seoul, and it shows in the manner in which he presents the perspectives of the North Koreans. Murakami does not, however, evince sympathy for the North Korean regime itself. As troubling as he feels Japan’s decadence is, North Korea just practices a different form of decadence, using the power of the masses to inflict equal suffering on all. There is no value, he suggests, in hardship for the sake of hardship. In that sense, Murakami is not nostalgic for prewar Japan. He does not have any illusions about the violence Imperial Japan inflicted on others or on its own people. The cure for the soul sickness that ails Japan is not authoritarianism, xenophobia, or militarism. In the novel, Murakami is dismissive when he describes Japanese right-wingers who want Japan to acquire nuclear weapons and remilitarize. Rather, Murakami’s prescription for overcoming decadence and moral torpor is not unlike that of Jean-Paul Sartre and other existentialists. As Sartre writes in “The Republic of Silence,” during the German occupation, individuals learned that there were values greater than life itself, values worth dying for if necessary: “At every instant we lived up to the full sense of this commonplace little phrase: ‘Man is mortal!’ And the choice that each of us made of his life and of his being was an authentic choice because it was made face to face with death, because it could always have been expressed in these terms: ‘Rather death than…’” Faced with decisions with mortal consequences, individuals learn that there is more to freedom than satisfying their every desire. Along these lines, Murakami depicts Fukuoka and Kyushu prospering in the aftermath of the invasion, with local governments making much-needed reforms to lessen their dependence on Tokyo, reducing their unemployment rate, and developing their own relationships with Japan’s neighbors in East Asia. By contrast, he suggests that the central government learned nothing from the incident, with the economy still in depression and Japan still isolated internationally. In the epilogue, one character finds himself wishing that the occupation had continued, with the implication that it might have forced the national government to learn the same lessons as the citizens of Kyushu. Murakami’s response to the 3/11 disasters in Japan suggests the important thing for him is hardship, not violence. As he wrote in the New York Times on March 16, 2011, “But for all we’ve lost, hope is in fact one thing we Japanese have regained. The great earthquake and tsunami have robbed us of many lives and resources. But we who were so intoxicated with our own prosperity have once again planted the seed of hope. So I choose to believe.” He wants the Japanese people to be forced to make choices about what matters to them, to make tough decisions and sacrifices instead of dithering or letting the national government or other countries make decisions on their behalf. His credo is, in short, a kind of hopeful existentialism, which he believes is the only way Japan will thrive in an era of economic uncertainty and a new multipolar global order. The two years since 3/11 surely must have disappointed Murakami, as politics quickly returned to business as usual in Tokyo and as the hardship endured by the citizens of northeastern Japan faded from the headlines and remained a local concern. And it is difficult to believe that the Abe government will satisfy Murakami. It is revealing, of course, that Abe chose to declare that “Japan is back” to an audience of alliance managers in Washington, D.C., suggesting that whatever steps Abe takes to strengthen Japan’s defense capabilities, he will do so within the confines of an alliance within which Japan is the junior partner. But even in Abe’s much-vaunted economic program — widely known as “Abenomics” — there are signs of the old bad habits which lead Murakami to despair. For all its boldness in monetary policy, the government has been reluctant to outline radical reforms when it comes to how the Japanese economy functions. A strong-state nationalist, it is unlikely that Abe will greatly reduce the dependence of prefectures and local communities on the central government or allow individuals greater autonomy. But then, it is clear in From The Fatherland, With Love that Murakami believes that Japan’s spiritual revival will not be the result of political programs or directives from Tokyo. The best that Tokyo may be able to do is step out of the way of Japan’s local governments and citizens. However, the aftermath of 3/11 contains a dispiriting lesson for anyone distressed over the health of postindustrial societies. There may be no escape from the society of the “last man.” Once people have come to enjoy a certain standard of living, it may be difficult to get them to think about anything else for very long. There may be nothing more for politicians to do than to distribute resources and try to keep the pie growing (or prevent it from shrinking too much). Frivolity may be unavoidable, even in the face of natural disasters and other tragedies. It may be that, once they’ve had a taste of prosperity, human beings have no interest in Sartre’s “austere virtue.” In that sense, From The Fatherland, With Love is a tragic thought experiment, an illustration of how difficult it is to rebuild society on the basis of hopeful existentialism. Nietzsche may in fact have the last laugh. Will Abe lead on the consumption tax? On Friday, Prime Minister Abe Shinzō headed off (jp) to the mountains in Yamanashi prefecture for an eleven-day summer holiday. He leaves behind a growing debate in Tokyo about the wisdom of proceeding as planned with the consumption tax hike scheduled to be phased in from 2014-2015 (5% to 8% in April 2014, 8% to 10% in October 2015). Abe has said he will make his decision about the tax sometime over the next two months, leaving proponents and opponents of the hike to make their cases once again. Arguably the supporters of the tax hike won several victories this week. First, at the start of the week the IMF advised the Japanese government to stick to the plan as concluded in 2012, arguing that the tax hike will signal the government's commitment to fiscal restructuring and will therefore bolster investor confidence. The IMF has been saying that the consumption tax rate should rise to 15% for years now, so its advice for Japan is not new. But the fund's intervention gives proponents an important international backer as they make their case to the prime minister. The next victory for proponents of the hike came on Thursday. Bank of Japan President Kuroda Haruhiko, speaking to the press after the BOJ policy board's regular meeting, voiced his support for raising the consumption tax and said (jp) that the BOJ's radical monetary policies and the planned hike were not incompatible. Like the IMF, Kuroda stressed the importance of reassuring investors that the Japanese government is serious about getting its financial house in order. Finally, on Friday the Nikkei Shimbun ran a major article (jp; registration required) — basically an editorial — addressed to senior government officials who are "nervous" about the consumption tax increase that sought to reassure them that raising the consumption tax next year would not be like raising the consumption tax from 3% to 5% in 1997. The article opens by explaining that the 1997 hike came in the midst of a regional financial crisis and at a time when the balance sheets of Japanese banks and corporations were loaded with bad debts. Having established that 1997 was a particularly bad time to raise the consumption tax, Nikkei pivots to say that since banks and businesses have more "stamina" today, it's appropriate to take on the challenge of the national debt in order to reassure global financial markets, which, Nikkei reminds us, are roughly three times larger than they were in 1995. With that in mind, the article warns that at the first sign that the government is not serious about raising the tax, investors will short Japan in a heartbeat. As arguments on behalf of austerity go, there is nothing earth shattering in the Nikkei article, in fact it contains pretty much the same arguments that Paul Krugman has critiqued for years, including in this 2010 column: the "confidence fairy" and the "bond vigilantes." But the arguments are less important than the reality that Japan's powers that be are lined up behind raising on the consumption tax on schedule in April 2014. The tax hike not only has the support of the BOJ president and Japan's leading business daily, but also the head of Keidanren (jp) its most powerful business lobby; Amari Akira, Abe's own minister for economic and fiscal policy; and leading members of the LDP, which has, after all, campaigned on raising the consumption tax for the last several elections. Of course, it almost goes without saying that the ministry of finance wants to see the tax hike proceed as scheduled. The forces arrayed against the tax, at least at the elite level, are thinner. Hamada Kōichi and Honda Etsuro, Abe's leading economic advisers, have both voiced skepticism about the current tax hike plan, with Professor Honda's arguing (jp) that the tax should be phased in at 1% a year rather than in two phases. Saitō Tetsuo, the chair of LDP coalition partner Komeitō's taxation committee, has stressed the need to take economic conditions into consideration when deciding whether to go forward with the hike. Beyond elite circles, perhaps most significant fact is that the public is overwhelmingly opposed to the tax hike: Asahi's post-election opinion poll found (jp) 58% opposed and only 30% in favor. Given that sustainable, robust growth is still far from assured — and that wages have yet to rise, suggesting that consumers would really feel the sting of the tax hike — the facts are probably on the side of the skeptics. The proponents still have to explain (1) why the confidence of global markets is so important when, as Michael Cucek reminds us, Japan is largely invulnerable to "bond vigilantes" and (2) why confidence would evaporate now as opposed to anytime over the past decade of swollen deficits. If anything, delaying the consumption tax hike should signal to financial markets that the Japanese government is serious about reviving Japan's economy. But this week shows that the facts have an uphill battle against a good portion of the Japanese establishment (with the support of international actors like the IMF). After finally securing a plan in 2012 to raise the consumption tax, they are not about to let the Abe government back out of its commitment. With the final decision resting on Abe's shoulders, this issue is as good a chance as any for Abe to show that he can be the strong, decisive leader he claims to be. Deputy Prime Minister/Finance Minister Asō Tarō kicked off the second leg of the second Abe government with a fine contribution to the hall of fame of gaffes committed by Japanese politicians. Now if you say "let’s do it quietly," you need to look back at the Weimar Constitution, whose amendment went unnoticed. It was changed before most people realized it had happened. We need to learn from this. I have absolutely no intention of rejecting democracy. But I don’t want to see us make these decisions in the midst of an uproar. The resulting international uproar — usually presented under headlines like "Japanese Finance Minister Taro Aso comes under fire for Nazi remarks" — has resulted in Asō's coming under pressure to resign from opposition parties, and under pressure from the prime minister (jp) to retract his remarks. He has retracted, but has said he will not resign. However, in my reading of his remarks, Asō's interpretation of how the Weimar constitution was revised may have been the least offensive aspect of his speech. What's offensive about Asō's speech is the arrogant disdain for the messy reality of democracy, the lament of every would-be utopian in history eager to ram the square peg of humanity into their round hole of choice. Asō repeatedly bemoans the "boisterousness," "tumultuousness,"and "uproariousness" present in public discussion of constitution revision. He seems to say, Why can't the people see that we know what's best for them? Can't they see that the facts demand revision? I read this less as a blueprint for revision than as a whine about how it's all the fault of the public and the mass media for how little success Japan's revisionist right has had when it comes to building a consensus in favor of their vision of the constitution. Why shouldn't the debate be boisterous? Why shouldn't there be uproarious and fierce opposition when the debate is about the document that serves as the nation's moral center — especially when the LDP's draft makes no secret of its plans to change the values enshrined in the constitution? Why shouldn't Japanese defenders of the constitution feel just as strongly about defending a document — a document that, whatever its origins, has become an important pillar of postwar Japanese society — as the revisionists feel about changing it? Who are Abe, Asō, and company to decide whether a debate is being conducted appropriately or not? At its best, liberal democracy is "boisterous" and "uproarious," because if the people have the freedom to speak their minds, there is bound to be a tumult. Politicians seeking order, politeness, and decorum can find some fine examples in Japan's immediate neighborhood. In the final analysis, I don't think Asō was longing for an end to democracy or outlining a secret plan for constitutional revision. Rather, he has once again revealed a fundamental fact about his and Abe's worldview: they have no problem stating their love for democracy as an abstract idea, a value to be promoted in East Asia and a rhetorical cudgel with which to bludgeon China, but they have little love for democracy as it is actually practiced in Japan. Abe Shinzō's LDP-led coalition with Komeitō got its wish Sunday, winning enough seats to retake control of the House of Councillors for the government and ending the "twisted" Diet for at least the next three years. With five seats still undecided, the LDP and Kōmeitō have secured 134 seats, comfortably over the majority threshold of 122 seats. But it is difficult to declare Sunday's results an strong mandate for Abe and his program. First, the LDP fell short of winning an outright majority. The LDP is once again the largest party in the HOC, but it will still need to secure the votes of Kōmeitō to pass legislation in the upper chamber. It is unclear what threats Kōmeitō can wield to modify the government's behavior — I doubt whether it can credibly threaten to leave the coalition — but since they wield the deciding votes in the HOC, they will be in a position to influence the government's agenda, which will likely have consequences for nuclear energy and constitution revision. One could argue that Kōmeitō was the real winner on Sunday. At the very least, we're probably seeing the emergence of what will likely be a persistent pattern should Abe remain in power. Abe and his lieutenants will talk about the need to revise the constitution, Kōmeitō will express its unease about revision, what's left of the left wing will sound the alarm, public opinion polls will reveal skepticism about revision, LDP grandees will suggest backing down...and rinse and repeat. It is difficult to view the HOC election as public endorsement for a shift to the right. Instead, we should view the HOC election as a sign that the Japanese political system is not "stable" or healthy. There is an emerging narrative that because the Abe government looks durable, the Japanese political system has achieved some stability after years of turmoil and ineffectual governments. Abe may well be in a position to last, although we won't really know until he actually has to make a controversial decision (about, say, TPP or nuclear power or the consumption tax). But the election returns suggest that these will be trying years for Japanese democracy. The DPJ has more or less imploded, and seemed to spend more time during the campaign fighting amongst itself than against the government. The Communists soaked up anti-Abe protest votes and won eight seats, including three district seats, but the ability to win protest votes does not necessarily make for an effective opposition party. As Michael Cucek noted before the election, none of the opposition parties has anything constructive to say about the problems facing Japan. 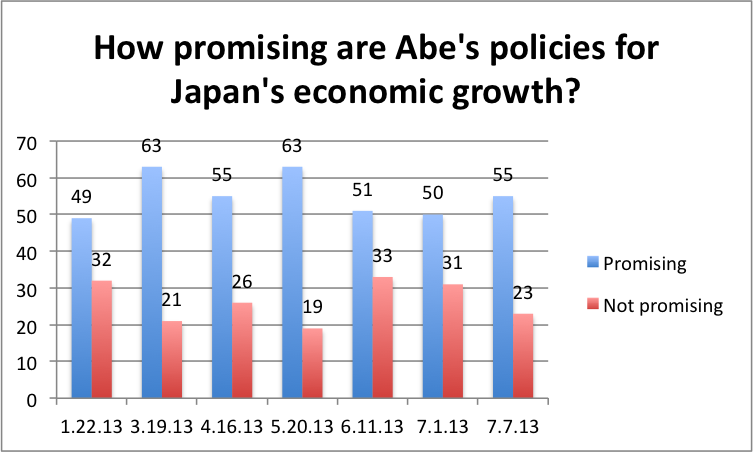 Abenomics is winning public support at least in part because it's the only policy program on offer. Kōmeitō is basically left being the opposition-in-government. I think there are votes for a center-left program, but no party or leader has articulated one in simple, easily understood terms. Whether a coherent, effective large party can emerge from the DPJ's wreckage is one of the most important questions in Japanese politics in the years to come. Finally, policy challenges remain. With control of both houses, Abe has no excuses. He cannot hide behind the "twisted Diet" any longer. He is going to have to deliver results and make decisions with the potential to trigger major public opposition. The media, of course, will be waiting to pounce at the first sign that the government is slipping — to say nothing of Abe's rivals within the LDP. The public is still opposed to nuclear restarts and is still opposed to raising the consumption tax next year. While the public as a whole supports Japanese participation in TPP, the LDP still includes an unwieldy mix of representatives from across the country, suggesting the possibility of a postal privatization-like confrontation between the urban and rural wings of the party. In short, the HOC election was not nearly as transformative as it may seem. By failing to win an independent majority in the HOC, the LDP will continue to depend on Komeitō to pass legislation. But by winning a majority for the coalition, Abe will now be expected to use his political power to follow through on his pledge to revitalize Japan's economy — with the public, the media, and rivals within the LDP ready to turn on him should he falter. Say what you will about the LDP, but the party has been fairly open about its preference for nuclear energy and restarting Japan's idled reactors as soon as possible. The party may be about to get its wish. On July 8th, four regional power companies will apply to the Nuclear Regulation Authority to begin compulsory inspections as a first step towards restarting their reactors. It will be months before the inspections will be concluded and plants reopened, but Monday appears to mark the beginning of the reintroduction of nuclear energy to Japan's energy mix in a significant way. the LDP and the prime minister have repeatedly said that they will defer to the judgment of the authority when it comes to restarting reactors, including the pledge in the party's manifesto last year and again this year. As long as the authority was not yet reviewing applications to restart reactors, deferring to the authority was an easy position to take. But now both the authority and the Abe government will be tested. For the NRA, it will be tested to show its independence from political decision makers, who have said they will respect the authority's decisions but have made no secret in wanting reactors put back online as soon as possible. For Abe, the pledge to defer to the NRA's judgment will be equally tested, especially if the authority rules against fast restarts for some reactors. Perhaps the best outcome for both parties would be for some reactors to be restarted and others rejected for the time being, thereby allowing Abe to show his willingness to respect the NRA's decisions while still pocketing the political benefits of less dependence on imported energy. It might also defuse some of the political opposition — preventing demonstrations like those seen above, for example — by showing that the government really did defer to the regulators. It may also defuse some of the opposition from Komeito, the LDP's coalition partner. The latest Asahi polling, discussed here, shows that the public is still opposed to restarts by a considerable margin (29% in favor, 53% opposed), but the issue is a second-tier issue and it is by no means certain that Abe would face the kind of demonstrations his predecessors faced, especially if Abe can pass the buck for restarts to the NRA. Meanwhile, by rejecting some applications for early restarts, the NRA could show its independence and demonstrate that it actually has some regulatory clout. Mind you, it is beyond my expertise to say what the inspections actually will produce. (This NHK article [jp] has a decent rundown of the new regulations upon which inspections will be based.) But it does seem that, while the public is firmly opposed to restarts, there is a way for Abe to avoid taking a serious political blow from the nuclear question. With the upper house election campaign in full swing — Michael Cucek has the campaign numbers breakdown here — there is no shortage of public opinion polling to wade through. Because the outcome of the election is more or less a foregone conclusion, not much of it is very interesting. However, it is still worth looking at if only to understand how the public is evaluating Abe's performance and what their priorities are as the campaign trucks fan out across the country. I've been paying particular attention to several questions in Asahi's national tracking poll pertaining to public assessment of Abe's economic policies. 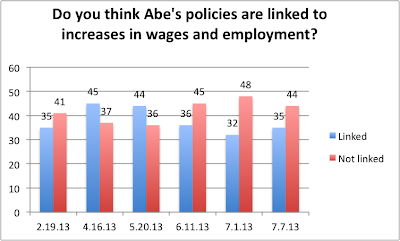 In addition to tracking the headline approval rating, I've been looking at one question which asks respondents to assess whether they approve of his economic policies (previously whether they believe Abenomics holds promise for growth), and another which asks whether they believe Abe's policies are linked to increases in wages and employment. In the latest Asahi poll (jp), conducted a week after the previous one, public support for Abe's economic policies improved slightly, rising to 55% approval from 51%, and, more importantly, disapproval fell from 31% to 23%. 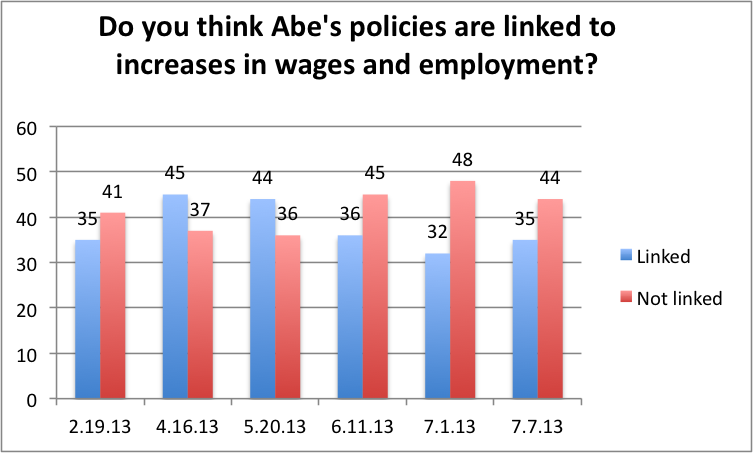 Abe also saw a slight shift in his favor when it comes to whether the public believes his policies are connected to improvements in wages and employment. Finally, this latest poll introduced a new question, asking respondents which policy they would like to see debated more during the upper house election campaign. 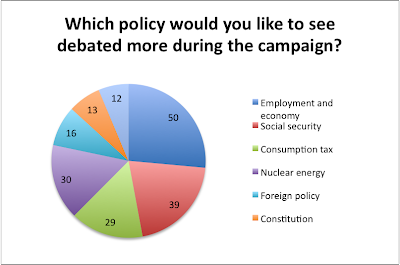 The poll is consistent with those dating back years: the public is most interested in economic growth and social security, followed by issues like the consumption tax and energy, and finally TPP, foreign policy, and the constitution. The fluctuations in support for Abenomics a few points one way or another probably don't mean much in the scheme of things, not least because last week's and this week's polls have had relatively small sample sizes compared to polls conducted earlier in the year. After getting responses from between 1500 and 2000 households for most of the year, the last two polls have had fewer than 1100 respondents (1039 last week and 1084 this week). By comparison, the June 11th poll that showed a twelve-point drop in support for Abe's economic policies had 1781 respondents. With approximately 51.8 million households in Japan, 1084 respondents gives us a margin of error of ± 3% at 95% confidence. Thankfully, a Yomiuri poll (jp) in late June found nearly identical results with more respondents (1821) when it asked whether respondents approved or disapproved of Abenomics: 54% approval, 31% disapproval. 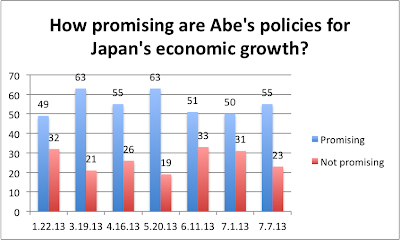 Thus we can say with a reasonable amount of confidence that public support for Abenomics remains at just above 50%. That, ultimately, is the most important number to watch. Because public support for the Abe cabinet rests so much on public support for its policies in the areas that matter most to Japanese citizens, i.e. the health of the economy, as long as the public supports Abenomics, they will support Abe. At the same time, if and when the public turns against Abenomics, Abe will be in trouble to the extent that growing unpopularity will create space for critics within his own party to undermine his program. At which point Abe will be pressed to show just how much he believes in the slogan he has lifted from Margaret Thatcher (jp): There Is No Alternative.